My sis has a pack for sale - it has 8 - one half yard pieces for a total of 4 yards of fabric. The whole pack only costs $22! She gave me a pack to bring back to Poland and I made THIS top from it. Yes. that was all. I did not add any fabric to it at all. I struggled a bit but I decided once again that a piano key border allows me to have a lot of give and take as to material. I couldn’t afford to make a mistake as I don’t have any more of this fabric here in Poland! I only had this one pack - no more. If I had been sewing in Florida and I messed up a cut, I could go and get another half yard as she is also selling the yardage. But I wasn’t. This top finishes at 54”x67”. You can see that we have 5 lights and only 3 what I would consider darks - and really only 2 of those were darker - I had the gray which I threw in the darker though I could have included it with the lights. But I needed darks! However, just playing with this fabric was great fun. it is a super quality and great to the touch! I had almost nothing left when I was finished. In fact, In order to make some of those frames with the gray, I had to piece them. However, just as people in days of old sometimes had to do that, I didn’t mind doing it. In the end, after it is quilted and ready to go, no one will pay any attention to it! 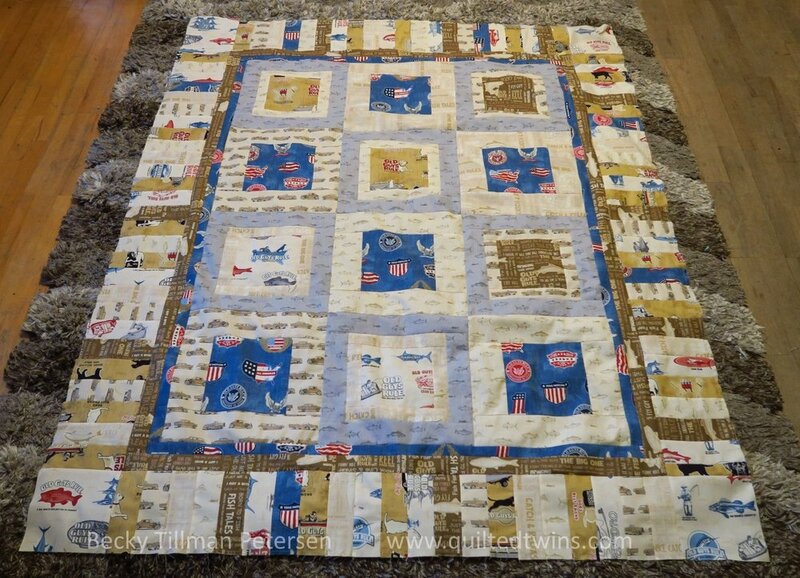 This quilt is made up of only 2 blocks - and a piano key border. 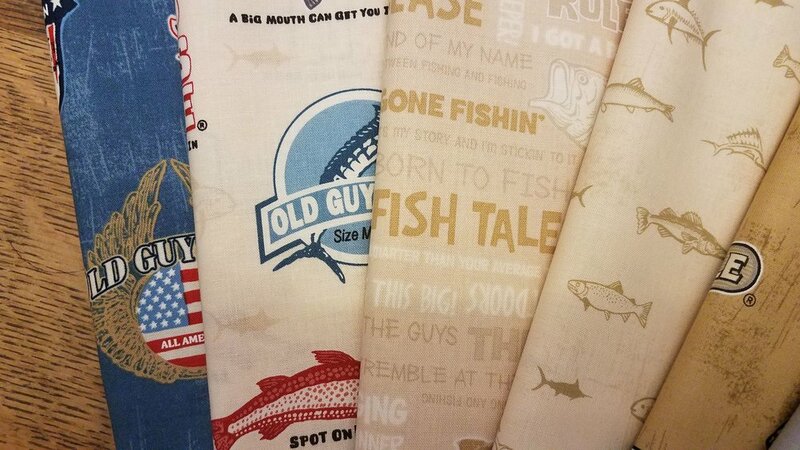 I think that the colors are warm and inviting and this would be perfect for your grandfather who loves to fish! It’s very Americana, which I didn’t realize until I was working on it - the blue fabric is very “patriotic”. The pattern will be included with your Old Guys rule pack of fabric pack of fabric here! For now it is only included with this pack of fabrics. It is not a free download available to all. It’s ONLY $22 and is a beautiful set of fabrics! And this is one of the things I’ve been doing lately here in my sewing room! Be sure to check out what my sis has to offer you in the store! She’s working hard to keep you in fabric! This fabric is narrower than your standard quilting fabric, but is still beautiful. Dark green with a green, yellow and green design on it. Faint yellowish golden stripes on the background of ecru.